When it comes to managing a commercial building, property managers have a variety of responsibilities. 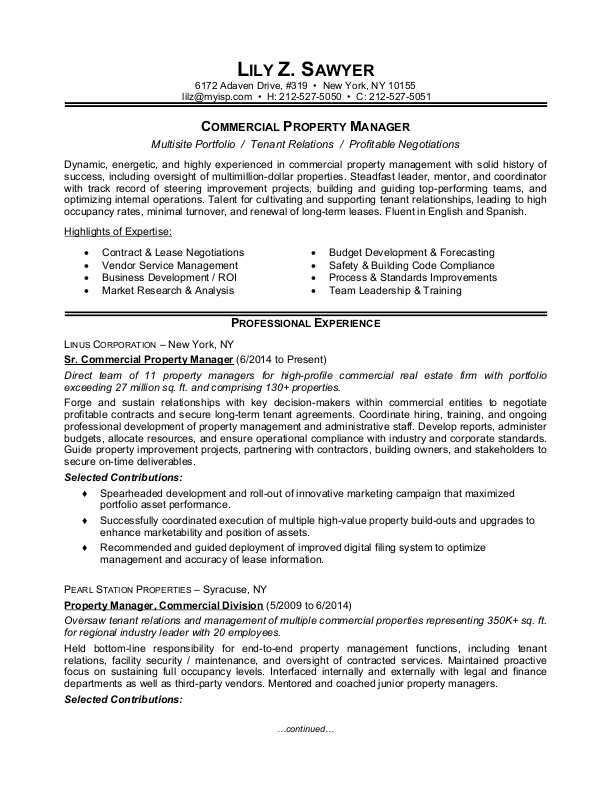 To see how to build up your resume to reflect your expertise and accomplishments in each area, view the sample resume for a commercial property manager below and download the commercial property manager resume template in Word. Jobs for property managers are projected to grow by 10% (or 32,600 jobs) from 2016 through 2026, which is faster than average, according to the Bureau of Labor Statistics (BLS). You'll find the highest level of employment for this job in the following states: California, Florida, Texas, Illinois, and New York; and in the following metropolitan areas: Los Angeles, New York City, Chicago, Phoenix, and Anaheim, CA. As a property manager, you can expect to earn a median wage of $58,670 per year, or $28.21 per hour, according to the BLS. Additionally, you can learn more about real estate careers and search for commercial property manager jobs on Monster. Dynamic, energetic, and highly experienced in commercial property management with solid history of success, including oversight of multimillion-dollar properties. Steadfast leader, mentor, and coordinator with track record of steering improvement projects, building and guiding top-performing teams, and optimizing internal operations. Talent for cultivating and supporting tenant relationships, leading to high occupancy rates, minimal turnover, and renewal of long-term leases. Fluent in English and Spanish. Direct team of 11 property managers for high-profile commercial real estate firm with portfolio exceeding 27 million sq. ft. and comprising 130+ properties. Forge and sustain relationships with key decision-makers within commercial entities to negotiate profitable contracts and secure long-term tenant agreements. Coordinate hiring, training, and ongoing professional development of property management and administrative staff. Develop reports, administer budgets, allocate resources, and ensure operational compliance with industry and corporate standards. Guide property improvement projects, partnering with contractors, building owners, and stakeholders to secure on-time deliverables. Spearheaded development and roll-out of innovative marketing campaign that maximized portfolio asset performance. Successfully coordinated execution of multiple high-value property build-outs and upgrades to enhance marketability and position of assets. Recommended and guided deployment of improved digital filing system to optimize management and accuracy of lease information. Oversaw tenant relations and management of multiple commercial properties representing 350K+ sq. ft. for regional industry leader with 20 employees. Held bottom-line responsibility for end-to-end property management functions, including tenant relations, facility security / maintenance, and oversight of contracted services. Maintained proactive focus on sustaining full occupancy levels. Interfaced internally and externally with legal and finance departments as well as third-party vendors. Mentored and coached junior property managers. Earned recognition for maintaining properties at high capacity with low turnover through on-target advertising, professional networking, and excellent tenant relations. Contributed to operational efficiency for well-established organization specializing in managing and maintaining residential, commercial, and industrial property. Assisted with improving wide range of property management functions, to include primary focus on interfacing with existing and prospective tenants and delivering top-flight client service. Prepared lease and rental agreements, ensuring accuracy and completion. Performed office administration and accounting functions, including balancing accounts, collecting and recording rental payments, and data management. Communicated with property managers, company leaders, and customers. Earned recognition for recommending new process for tracking status of lease negotiations and agreements resulting in significant time savings and improved client relations. Provided support for wide range of operations and projects as well as gained valuable industry insight. Participated in multiple and concurrent construction and building maintenance projects, delivering support to project contributors and stakeholders. Performed research and analysis as part of bidding and proposal development process. You're responsible for maintaining properties, but when it comes to overseeing your job search, you might need some assistance. Could you use some help strengthening your resume? Get a free resume evaluation today from the experts at Monster's Resume Writing Service. You'll get detailed feedback in two business days, including a review of your resume's appearance and content, and a prediction of a recruiter's first impression. Let the experts at Monster show you where and how you can make adjustments to your resume so that it helps you stand out from the crowd of competitors.